I’ve been on a colorful salad and bowl kick lately. This Rainbow Quinoa Salad did not disappoint. Can you sense a taste trend here? I also really liked this Peanut Ginger Dressing and it was very easy to make. I made this salad dressing combo during the week when I had exams and presentations and had my last serving today. Can I already have another? I used a combination of yellow and red bell peppers to give a more colorful kick and balance the other colors. Served cold, it hit the spot during this warm, toasty April week. My dad flew out of Boston this weekend, so naturally my mom sent down some salmon and chickpea fesenjan from Minimalist Baker (delish, btw) down from Maine. I had some leftover bok choy and scallions in my fridge, which are the makings of a perfect salad. Sesame salmon and tahini go oh, so well together. I whipped up an easy dressing and had the best lunch: Sesame Salmon Salad with a Tahini Dressing. This dip is light and refreshing. Originally a Greek yogurt dip, tzatziki is traditionally made with cucumbers, garlic, salt, olive oil, sometime lemon juice and fresh herbs like mint, dill, parsley or thyme. It can be used to top gyros, burgers, falafels, salads, “bowls” (see photo below) or a standalone dish. Clearly I took a non-traditional route, swapping avocado for yogurt as the base. I also used mint instead of dill and want to try this again with equal proportions to be more versatile. Even with the “lightened up” swaps, Avocado Tzatziki is still light, so fluffy and especially tasty. I’ve been dipping away with Kashi pita chips and 7 grain crackers, baby carrots and cucumber sticks. I’m coming out of a hiatus! With my full-time job wrapped up and my fun-employment commencing, i.e. taking care of business for the month for August before my nursing program begins, I’m finally writing these joyful introductions for my blog posts — like this one for a BBQ Chicken Salad with Cilantro Lime Dressing. After a trip home to Maine and a stop at Stonewall Kitchen in Portland, I picked up their Honey Sriracha Barbecue Sauce in anticipation of making a BBQ chicken salad. The BBQ sauce is packed with heat and subtly sweet. 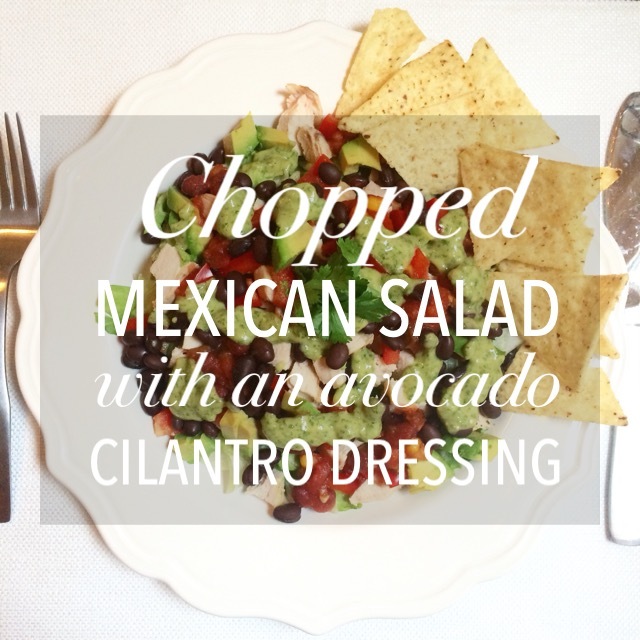 The dressing was inspired by a local Mexican restaurant and was the perfect combo of light and fresh to complement the BBQ flavor. Say hello to your new favorite summer salad. When you hear “tuna salad,” you think of that canned tuna slathered in mayo and crammed between lettuce and bread. I don’t mean that kind of salad. I mean a salad salad — one packed with greens, fresh veggies and a bright dressing, all the while brimming with texture. This is the anatomy of a perfect salad. The key to the greens is to chop or tear kale and spinach into bite-sized pieces for easy eating. Radishes are a crisp spring vegetable with a crunch. Paired with carrots and cucumbers and balanced by creamy, smooth avocados. Tuna, albeit canned, is packed with protein and omega-3 fatty acids. Plus it’s inexpensive and easy to store/keep compared to the fresh variety. Have I convinced you yet? This Spring Tuna Salad is sure to add a bounce to your step with its bright flavors and lighter but heartier nature. I used to make salads all the time last year and they always involved fresh mozzarella, avocado and some sort of fruit. Usually over spinach, toss in some walnuts or almonds and add some chicken or turkey. This salad needed less; it needed to be simple and basic, but not in taste. I wanted a spin on a caprese-like salad but chopped and easy to eat. 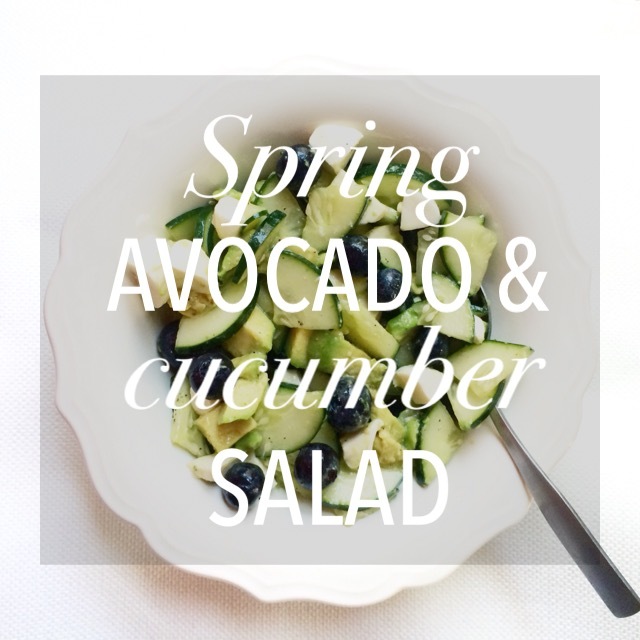 Fresh ingredients prepared in an obvious way creates the Spring Avocado & Cucumber Salad.